Who doesn't love listening to music or enjoying a movie's spectacular sound effects? Or a crooner's powerful vocal performance? Great sound is one of the most basic but often least emphasized aspects of communication. A key piece of equipment often overlooked in producing amazing sound is the pop filter. But what does a pop filter do? That is a question many people have. What Does a Pop Filter Do? Can you make your own pop filter? One of the hardest things to do is to control the quality of recorded sound. Most people probably think the microphone is what matters most. Although that surely is important, this view is also very limited. An equally important tool, the pop filter, is also critical in producing amazing sound quality. So, what does a pop filter do? And do you need one? Let's find out. Just what does a pop filter do exactly? Most people who are starting to practice sound production probably think a pop filter is just artistic overkill. Many novice sound producers simply think of recording artists in a sound booth speaking or singing into a microphone. They see a black disc between the artist and the microphone, the pop filter, and they think “That's just for the professionals.” Not only is this wrong, but it's also short-sighted. What does a pop filter do? It mitigates plosive sounds. Plosive sounds are vocal popping sounds that happen naturally when people speak or sing, especially when making the sounds t, d, p, and b. Other sounds are from vibrating your vocal cords. These sounds have weak flows of air. But making the t, d, p, and b sounds produce a rush of air that blasts into the microphone's diaphragm and creates a loud popping output. This disruptive sound is unpleasant to the ears. Making adjustments on a microphone can reduce the strength of these plosive sounds but cannot remove the output completely. Only a pop filter can effectively stop this irritating noise. Hearing those pops ruins the quality of the audio and can turn off anyone trying to listen to a performance. So, many podcasters, moviemakers, Youtubers, and radio hosts use a pop filter. It doesn't matter if you're a first-timer or an experienced sound engineer. Removing natural speech noise like vocal pops can be the difference between a good sound and something that is painful to listen to. A pop filter acts as a screen that allows the plosive sound to pass through it but then diffuses the air blast. Doing this lessens the strength of the impact of air and also makes the movement of air more random instead of focused in one direction. In the end, there is no concentrated push of air and thus no recorded vocal pops. The sound still passes through this screen, so the recording doesn't suffer much high-end loss. Pop filters focus on plosive sounds from speech, so it is most effective for cleaning up voice work or singing. When recording requires the microphone to be relatively close to the speaker or singer, pop filters are very valuable. They are also useful for recording musical instruments that have strong air blasts. Pop filters are most effective when used for indoor recording. Some people think that placing a foam windshield on a microphone can do the trick, but that's not true. That may work for gentle and wide gusts of air. But a foam microphone cover cannot prevent vocal pops from a concentrated blast of air from a speaker or singer. So what does a pop filter do to control these concentrated bursts of air? A pop filter sits a few inches away from the microphone. This gives it enough space to diffuse the air and let the sound carry through. So what does a pop filter do for your equipment? Amazingly, pop filters actually protect your equipment from wear and tear. The strong input of air and sound can slowly wear down a microphone's diaphragm, output transformer, and preamp. The explosive noise that results from vocal pops is bad for the microphone in the long run. Moisture is also the enemy of any electronic device. So when your speakers or singers "spray it" as they say, your microphone is actually dying a slow wet death. A pop filter takes the brunt of the spray from performers, which helps your electronic equipment stay dry and last much longer. No matter how you look at it, pop filters are simply a must-have in sound production. They help you create better quality sound and help you maintain your sound equipment. What does a pop filter do? It can depend on the materials, as well. Different materials have different advantages. Weigh the pros and cons of your filter options first. Many people find it economical to make their own filters from tools they have lying around the house. Others prefer to buy high-end pop filters. Some people even choose to substitute a typical filter with a functional replacement. People have tried to use pencils placed in front of microphones. Others have even used socks (clean socks!) pulled over a microphone. As a rule, it's best to determine which filter best suits your purposes and budget. Yes. A pop filter isn't very complicated and definitely falls under the category of things that can be DIY-ed. You can use hard but flexible wires and nylon tights. You just need to create a circular frame covering a large enough area to catch the blast of air from the speaker or singer. Then, stretch the nylon over this frame to serve as the filter. You can then use the rest of your wire to connect the pop filter to the microphone stand you're using for the mic. You can also use a sewing circle or any other strong ring-shaped skeleton (old bubble-blowers and the like) as a frame. Remember to place the frame a few inches away from the microphone. Other people have even simplified the process of making a pop filter and instead use a functional replacement. An old standard in sound production is to use a pencil in front of a mic to diffuse air blasts. Others have also tried placing different varieties of cloth over microphones. Should you make your own pop filter? Although you can make your own pop filter easily enough, the question really is about quality and durability. Nylon tights tend to rip and break, especially with wire. Torn or overstretched nylon won't sufficiently disrupt the burst of air from plosive sounds. It can also affect the evenness of the produced sound. Some people try to use two of these filters spaced apart to remove the popping sounds. However, this will affect the depth of sound. The speaker or singer will have to perform more loudly to make sure the sound gets through. The strength of the wire can also determine the durability of your self-made filter. Constantly having to readjust or reposition your filter (or worse, rewiring it completely) wastes your time and resources. Using functional replacements also produce low-quality sound. Either they don't diffuse the air blasts well enough, or they muffle both the air and the sound. Buying a real pop filter might be the most convenient and efficient option. In general, filters with slightly wider holes produce a cleaner and fuller sound. And there are differences in performance and durability as well. Two of the most common materials for pop filters are nylon mesh and metal mesh. Nylon mesh pop filters are the most commonly used filters for sound production. These are quite affordable and are widely available. They are the standard for most of the music industry. The nylon does a great job of removing the unwanted output from plosive sounds because the holes in the mesh are small. This material diffuses the explosive air effectively. However, there are several downsides to using a mesh with smaller holes. First, tighter filters screen out more of the sound, especially the ones with a higher frequency. That results in a significant loss of high-end sound. Many sound engineers find this distortion unacceptable. Although the recorded sound is pop-free, the dulling effect on high-frequency input can decrease the sound quality. In addition, nylon mesh is known for being delicate and can be torn easily when used without care. Replacing torn nylon mesh happens frequently. So, this option isn't as cheap in the long term as you might think. Pop filters can also consist of metal mesh. Though typically more expensive, these are more durable and thus worth the higher price. In general, metal mesh filters are smaller, which makes them easier to pack and lug around. That also makes them less of a hindrance for performers. Metal mesh also has larger holes than nylon mesh. The large holes still significantly diffuse the blast of air from speech or singing. They also effectively randomize the flow and direction of the air. In essence, this mesh is just as effective in removing vocal pops. At the same time, the larger holes allow more high-frequency sounds to get through to the microphone. So the recorded sound suffers less high-end loss and distortion. In other words, metal mesh pop filters help protect the integrity of the sound. It's important to note though that despite being much more durable, you can still damage metal mesh. The metal is thin, and you can bend it if you don't protect it adequately. Bending and breaking can lead to sound distortions. In the long run, metal mesh can at times suffer from a gentle whistling that registers in the recorded sound. What does a pop filter do? The shape can have a lot to do with it. Most pop filters are simply flat. When recording speech or song, the performer's voice usually comes from a single direction. That means that the air that comes with plosive sounds also comes from just one direction. Because of this, a flat design acceptable. A flat pop filter can capture most of the air blast from a stationary source. However, some performers tend to move around when delivering their speech, dialogue, or song. Some performances also require movement, multiple directions of sound, or multiple sources of sound. For example, a choir or a group of backup singers have more than one source of air blasts. In these situations, a flat pop filter might not be sufficient. Vocal pops are likely to still get through the filter. In these cases, curved filters are much more effective. What does a pop filter do when it has a curved shape? It can actually cover a wider, multi-angled area. Curved pop filters can protect a microphone from the concentrated air from a mobile performer or multiple performers. A flat filter would require performers to be more rigid or always to try and hit the center of the pop filter. A curved shape allows performers to speak or sing more naturally and freely into the filter. Of course, having no filter at all would be the worst. That would force the performer to constantly move away from the microphone when making plosive sounds. What does a pop filter do? Well, it can be important in producing a professional sound. Using a pop filter helps to improve the sound quality you can produce. It also allows you more freedom regarding the performance whose sound you're trying to capture. Still, some people will tell you that a pop filter is nothing more than artistic fluff. They'll say that a great microphone is all you need to get started in sound production. But a pop filter can be the fine line between a harsh sound and clear audio. It is the difference between amateur production and a professional approach. Quality is synonymous to success when it comes to sound production, and a pop filter is your quality assurance tool. Without it, you'll end up producing sound featuring noisy puffs of hot air, literally and figuratively. So the next time someone asks you, "What does a pop filter do?" 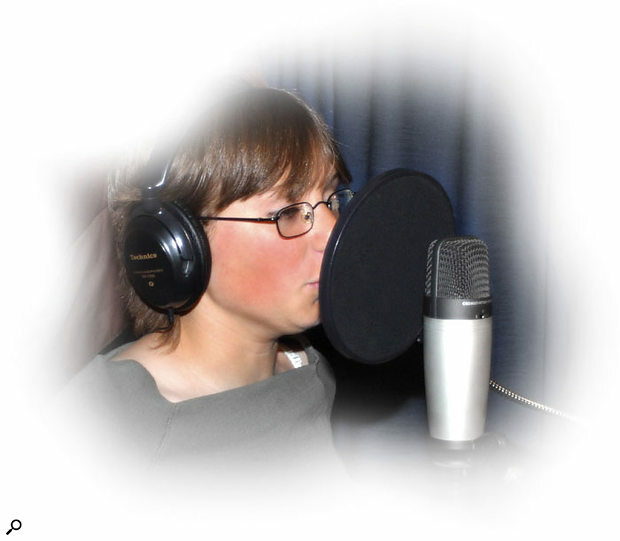 be sure to stress the importance of the pop filter in producing amazing sound recordings.